The siding on this is a little odd looking close up, but from a distance it looks really cool. Seems to shimmer, sort of - a lot like the wind wall at Target Field. That's a decent way to put it. It's like if you had a multi-hued brick pattern, except the bricks were made of aluminum. It's unique, that's for sure. Credit to the the developer and the architect for trying something a bit different than the standard large metal panels or premade brick sections. It looks like the same exterior material as the new Uptown library, but in multiple colors. Sorry, I tried to add two pictures in one reply and it didn't work. I'm a little new at this so please be patient. The siding looks really cool so far, can't wait till it's all finished and Trader Joe's is finally opne. Well look at that, Trader Joe's web site now shows this location as "Opening Soon". Maybe they'll open a farm stand beside the site on Washington Ave come Spring? Otherwise we have how long until this is complete? I like the way the height variation turned out. 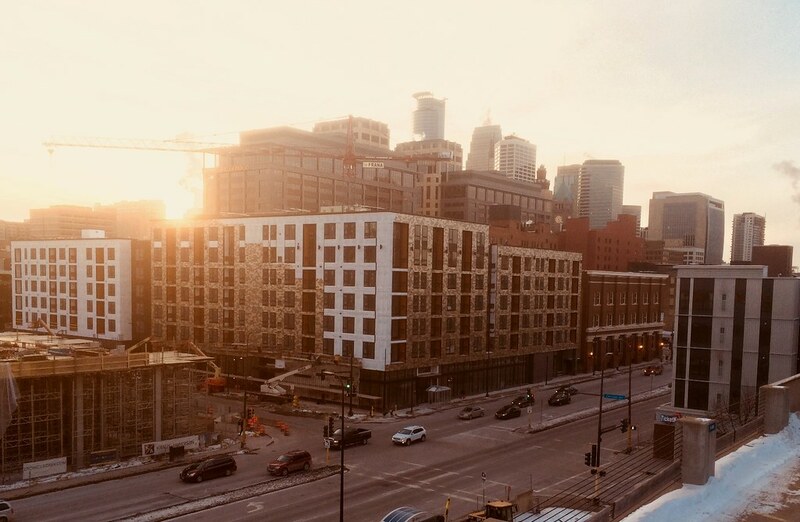 Timeline updates: Trader Joe's, the apartments, and the Jimmy John's should be opening in June, the Canopy hotel in January. How did they manage to do 6 levels of wood? Are the top units lofted? That's a great question honestly. Yeah, there's a loophole that allows a 6th floor of stick construction if you can count it as a mezzanine. Quite a few developments in the area have done this. Doesn't the ceiling floor between the first and second floor have to be poured concrete for this to be allowed. The first floor was poured on this structure - in part because of the high traffic/larger foot print retail on the first floor. The rated separation is required regardless of whether there's five or six floors of stick above it. ah, good to know... I hadn't noticed that concrete floor on every project but I easily could have missed it or not noticed. Starbucks will fill the remaining retail space, taking the space that is directly next to The Old Spaghetti Factory. Starbucks has spread like wildfire over the past few years - are they finally going in for the kill against Caribou? Having recently traveled to new York, sfo, and Chicago I'd say we're still pretty sparce on locations in comparison. I think they're just finally getting the new appropriate retail bays they've needed.